Free Shipping Included! Smart Projector, MiraTekk RD-805A 1080P Full HD Projector 800 Lumens 800x480 Native Resolution Support HDMI/VGA/USB/AV OUT (Black) by Miratekk at Nebula Fia. MPN: MEA060001BK. Hurry! Limited time offer. Offer valid only while supplies last. A Projector that bring you fantastic home and outdoor entertainments. Features: Portable mini projector with long lifespan up to 50000 hours . A Projector that bring you fantastic home and outdoor entertainments. Portable mini projector with long lifespan up to 50000 hours . Enjoy visuals at a best resolution of 800 X 480 Pixels. power consumption Easy changing in 16:9 & 4:3 aspect ratio. [Imaging System] Adopt Single Panel LCD Technology with More Than 50,000 hours of LED lifespan, features 800 lumens brightness, 1000:1 contrast ratio design and 800 * 480 (WVGA) resolution, supporting up to 1920 * 1080 (for a 1080P video-allowing you to watch your favorite movies in high definition).Usually, when the projectors works, the fan will make noise to Radiating due to the highly temperature. It will be better that you can have a break after 3-4 hours using to avoid overheating. 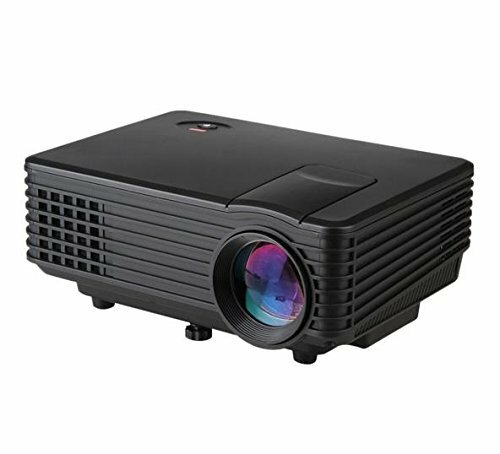 [Light and Compact Portable] Adopt light and compact portable design, RD-805 LED Projector owns small size (21.0x14.5x8 cm). Fit an entire home entertainment system in RD-805 LED Projector. You can easily carry it with you, conveniently watching all your favorite movies or making an impressive business presentation any time and anywhere. [Super Companion for Entertainment] Support multimedia formats (Videos, Music, Picture, TXT), deal for movies and video game use. Light & mini size, easy to carry, great company for home entertainment and travel use. [Adjustable Projection Distance & Projection Size] Offer 30-100inches image size and 1.0m-3.5m Projection Distance (Only can adjust the size of image by change the distance). Giving you a clear frame and a projection size of up to 100 inches, you also can select the optimal size of image by adjusting the distance to obtain the best Use Experience. [Widely Compatibility] Equipped with HDMI, VGA, AV USB and Headphone jack, easy to connect with NoteBook Laptop, DVD, PC, Smartphone, USB disk, etc. Just enjoy your favorite videos or movies with bigger screen. If you have any questions about this product by Miratekk, contact us by completing and submitting the form below. If you are looking for a specif part number, please include it with your message.